InsurTech VC is Mega Hot! What do Ashton Kutcher, Tech behemoths such as Google/Alphabet and Alibaba, top venture capitalists, leading insurance giants and German publishing houses have in common? They have all discovered InsurTech as a potential goldmine and are chasing startups with their venture capital dollars. In aggregate, they have invested $2.7bn globally in 2015, which is more than 3.5x the 2014 number. And What’s Going on in Germany? Apparently, InsurTech VC is mega hot at present. 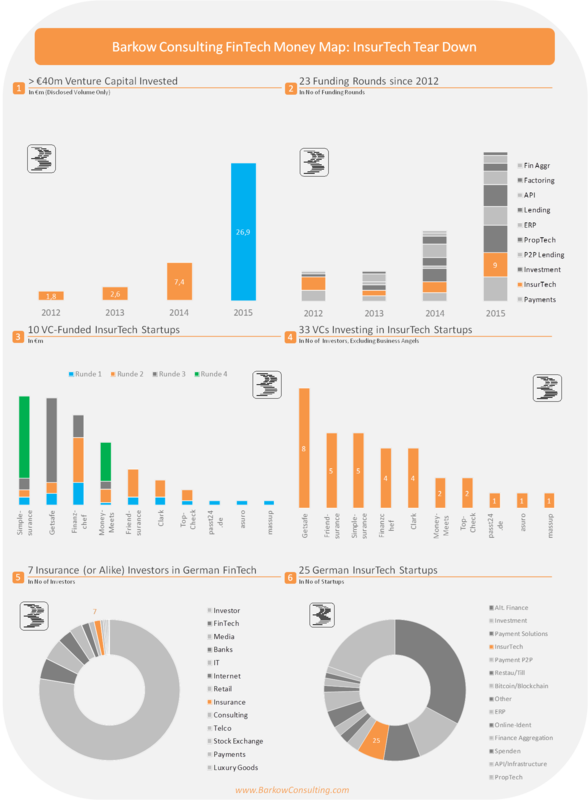 After fairr.de has been awarded FinTech of the Year 2015 it’s definitely time to see, what is going on in Germany. Consequently, we have drawn down relevant InsurTech info from our proprietary Barkow Consulting FinTech Money Map data base. Please click two times on below Infographic to enlarge.